A year ago Athearn delivered HO scale models of the three McCloud Railway SD38's painted in the brown and orange paint scheme. 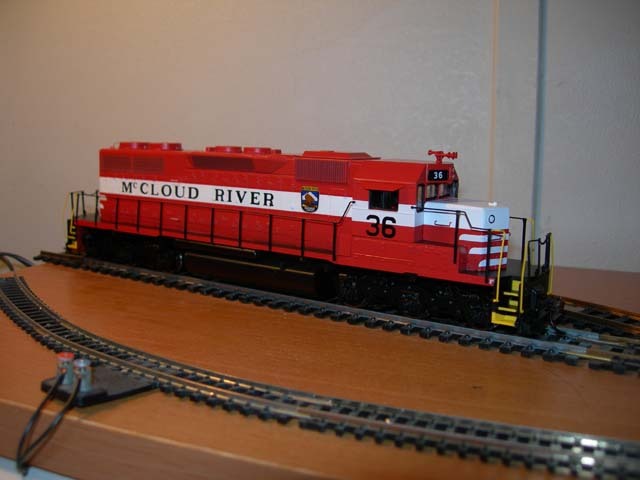 McCloud Rails reviewed those locomotives in another page in the models section of this website. The models contained several shortcomings, mostly in the paint and lettering department. The only major structural deficiency came in the location of the fuel tank, which on Athearn's model is mounted immediately behind the front truck, with a space between the tank and the rear truck; on the real locomotives the tanks are located up against the back truck, with a space behind the front truck. 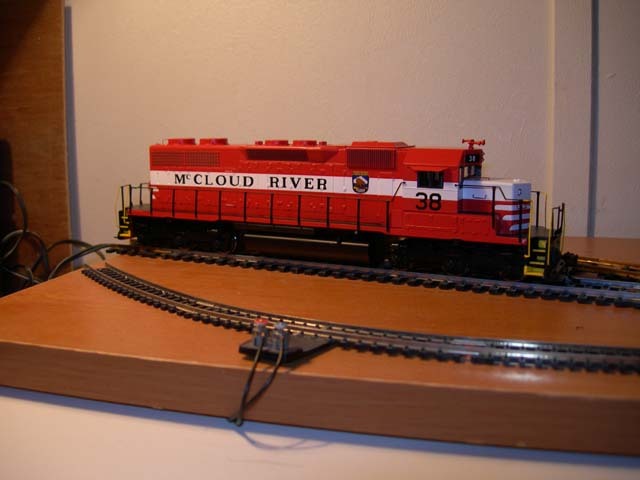 The locomotives were welcome additions to the HO scale market, as they were the first commercially produced diesels painted for the McCloud. Many modelers complained to Athearn about their choice of paint scheme, and apparently Athearn listened. 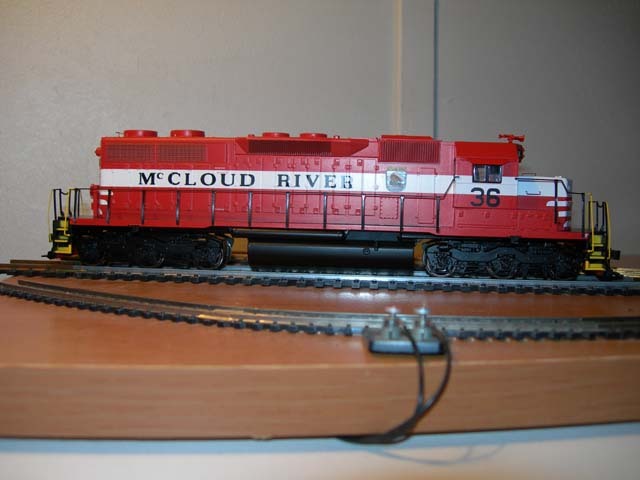 In October 2006 the manufacturer announced a second run of SD38's, with this run to include models painted in the original McCloud River orange and white. Athearn projected that the models would arrive in early March 2006; they beat this estimate by a full month. As with the first run, these are beautiful locomotives. The details are crisp, and the paint job is much better than the first run. The colors on these models actually come close to matching the prototype. These locomotives are not equipped with snowplows, but do have footboards. 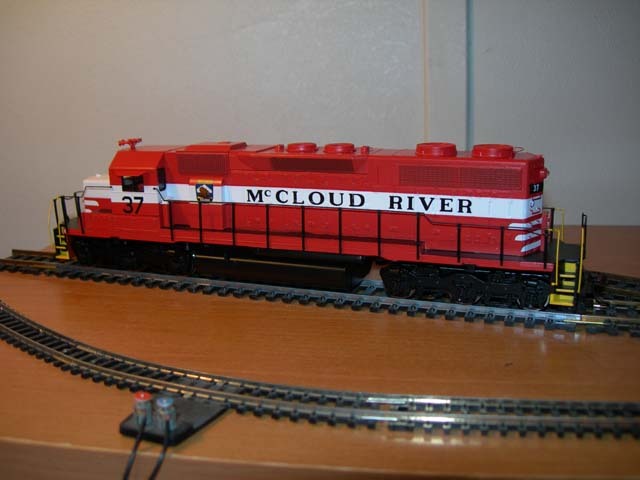 The only glaring problem that McCloud Rails staff can find in our initial review once again lies with the fuel tanks- they are the same as those featured on the McCloud Railway models. 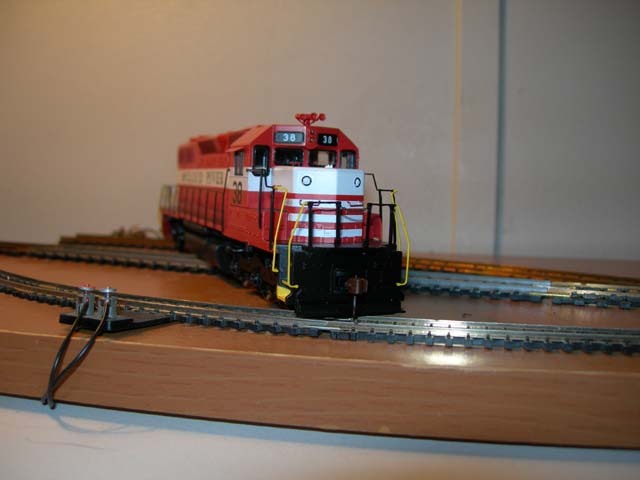 In real life these units only carried the larger fuel tanks for a very short period of time while still wearing the original paint, so to be "correct" these models only represent what the units looked like in the 1978-1982 time frame, and once again the tanks are mounted at the wrong point on the frame. The way the models are constructed makes it nearly impossible to switch the tank location; however, someone could mill the existing tank down to approximate the 1,200 gallon tanks these locomotives carried through most of their early years. These models should make those disappointed by the first run a lot happier. "Wedgie" shot of the #36. A side view shot of the #36. A "going away" shot of the #37. A close up of the #38's front.